← How do I remember all the things I see in the garden? Last week my journal ended with lots of questions and pictures of plants with no names. So how do you learn the names of plants in a wild garden? I discovered there are many ways at Eloise Butler. One way is to look for the tags that are placed throughout the garden – that one is easy. Another way is to stop by the Visitors Center and ask if they can help you name them. All this is great if the center is open and someone is there to help, or if the tags are by the plants. (I also find I can e-mail a picture to my friends who like plants and they often will know the names but that means a camera, computer and e-mail.) None of this is great help when I am walking alone on the trails and want to learn the names so I can talk to others about what I have seen. This is where a field guide is helpful. A field guide is a book, or an app on your phone that helps you to name plants. It is full of pictures, names and information about the plants and where they live. You will still need to use your careful observation skills to find the right name for your plant. Here are some questions to ask your self when searching for a plants name. What is the shape of the leaf? How many leaves on the stem? How many petals does the flower have? This plant I could not name last week – has white flowers with four petals. The center is yellow and the leaves have sharp edges. I found it growing on the side of a hill and up away for the wet marsh areas of the garden. 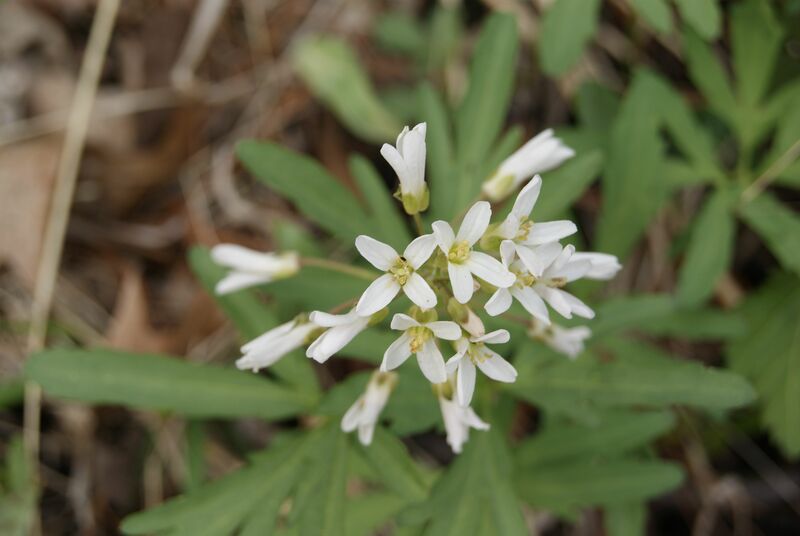 After looking at several pictures in books and asking friends we decided it was a Cut-leaved Toothwort. There are lots of questions and lots of noticing going on. When I am walking I don’t like to carry so much stuff – books, camera and journal – so I just bring my journal to draw small pictures of the plant, write down what I see and maybe take a picture if I can. Often my camera is not with me so I need my eyes, my pencil and my journal. I tried to not write things down about a plant the other day but when I got home I could not remember the details. I knew the plant was yellow, and grew in the marsh where it was really wet but how many petals did it have, what did the leaves look like? I wished I had written it down and drawn a picture to help me remember. Here is the new plant I found this week. 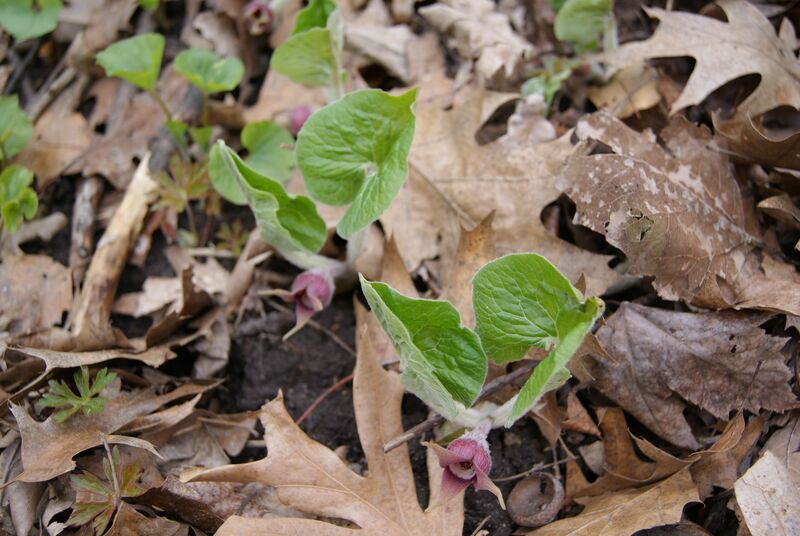 It was growing in the dry woods, has fuzzy hairs on the leaf and stem. There seems to be two or three leaves to each plant. It has a flower that is purple right at the ground where the stem is growing – not up on top of the plant like some plants I have seen. Can you name it? Have you found flowers and plants you can not name? Draw a picture of them in your nature journal, write down some facts about the plant ( field notes) and then use a field guide to help you find its name? Can you name the plants in the picture? This entry was posted in Garden Learning, journals, Reflections and tagged wild gardens, wildflowers. Bookmark the permalink.